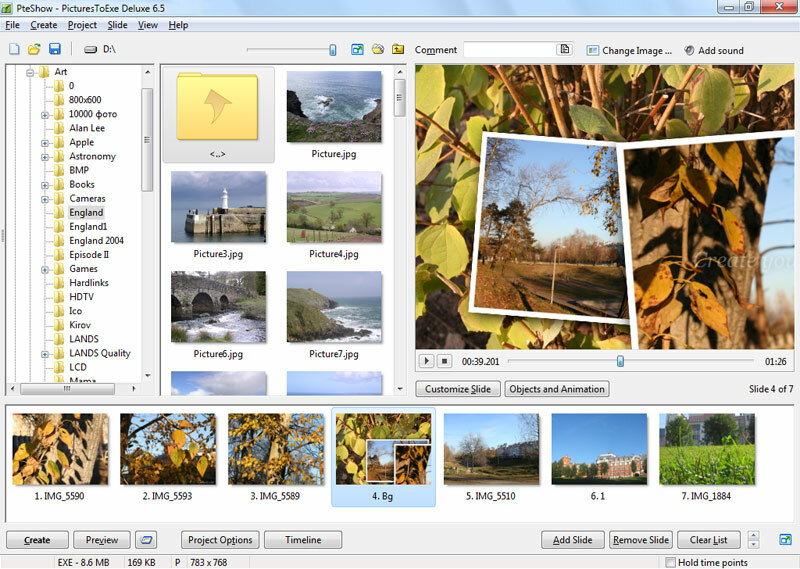 Photo slideshow software. 3D effects. Output for PC, Mac, DVD & YouTube. ...... PicturesToExe Deluxe is able to create a proper slideshow for any occasion: to tell friends and relatives about a wonderful trip or to present a new project to business partners. PicturesToExe creates an executable EXE file that does not require any additional program to run the presentation (even PicturesToExe itself is not necessary). The slideshow can be accompanied by sound or text comments to each slide or by any music file from your collection. The timeline with a waveform facilitates the synchronization of the pictures to the background music. Pan/Zoom/Rotate including 3D transition effects can make the slideshow more dynamic and vivid. Moreover, a simple editor of mask presets has been added. Qweas is providing links to PicturesToExe 7.0.5 as a courtesy, and makes no representations regarding PicturesToExe or any other applications or any information related thereto. Any questions, complaints or claims regarding this application PicturesToExe 7.0.5 must be directed to the appropriate software vendor. You may click the publisher link of PicturesToExe on the top of this page to get more details about the vendor.